"Click here for Z Series Booths"
Advanced Interior Manufacturers offers a complete nationwide service from blueprint to installation. We guarantee satisfaction with quality booths, competetive pricing, and prompt installation. We offer over 20 standard booth styles made with solid wood frames and the highest quality foam seats to ensure years of comfort and support. At AIM, you are not limited by standard booth designs. We can custom build anything you can put into a blueprint. Our experienced staff welcomes the challenge. We work with a variey of materials: leathers, vinyls, fabrics, woods and laminates. 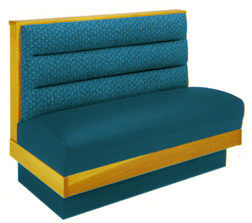 All our upholstery seating is assembled by hand to maintain our high quality standards. With the owner's careful attention to detail, and years of experience, we know you will be satisfied with our products and service.